Let the Writers’ Rumpus Start! Does the wild rumpus start or begin? Scroll to the bottom of this post and join the conversation. Yesterday would have been Maurice Sendak’s 85th birthday. Hope you caught the elaborate Google Doodle in his honor. 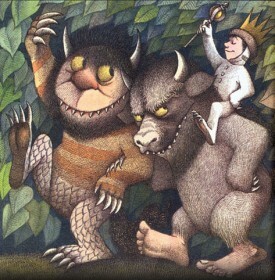 So this is a particularly auspicious week to launch our new group blog, “Writers’ Rumpus,” whose name honors the famous line in Sendak’s Where the Wild Things Are: “Let the wild rumpus start!”* I’d like to pretend that we planned it this way, but it was mere serendipity. Why start another blog about writing and illustrating for children? We’re all members of a Massachusetts-based SCBWI critique group. Andover’s Memorial Hall Library is kind enough to host our monthly meetings, asking only that we remain open to new members. Some new members arrive knowing quite a bit about children’s writing, illustrating, and publishing while others arrive knowing only that their creative fire has been lit and they can’t stop writing or drawing. So one goal of our blog is to share information to help newcomers navigate this new-to-them world—whether the newcomers attend our meetings or read our blog from afar. One result of being perpetually open is that, by critique group standards, we are HUGE! We are a humongous rumpus of a critique group, averaging between 15 and 20 members at any given time. With this many people, we don’t have enough time during meetings to share news about conferences, contests, rejections, requests for full manuscript, and yes, contracts and book launches, before we have to start critiquing. Our between-meeting group email trails were getting out of hand and we thought, “there has to be a better way!” And there is. So another goal of our blog is to have a place to share news of note, both among our members and with the wider community of everyone who’s interested in children’s publishing. Welcome to our Writers’ Rumpus! Hope you stick around. * By the way, it turns out there is a bit of disagreement about whether, in Sendak’s book, King Max commands the wild rumpus to start or begin. One possible explanation for the confusion is that the rumpus starts in early editions of the book. But books published starting in the late 1980s have the rumpus begin. When did the rumpus start to begin instead of start? Or stopped starting and began beginning? Do you have a copy of Where the Wild Things Are? What year was it printed, and which does it say: “let the wild rumpus start!” or “let the wild rumpus begin!”? I’m delighted to find this post. When we got this book for my niece, I was stunned to read “Let the wild rumpus start,” because I vividly remembered it as “begin” from my childhood in the eighties. It made me think my mind was starting to go! So it’s quite a relief to learn that it was something as mundane as a difference in editions, although it’s quite strange that the difference was there at all. I’ll agree, though, that “begin” sounds much more natural. Thanks for commenting, Nick. No, you’re not losing your mind! And good for you for introducing your niece to a true classic. Late to finding this post, but grateful that I have! I am a bit of a stickler with writing and am making birthday invitations for my friend’s son- I distinctly remember “begin” in the phrase and only questioned it when I was looking into invitation examples that had “start” written! Although it may just be an opinion, I feel that “start” sounds incorrect. It just doesn’t roll off the tongue the same way! I’ll have to find my physical copy and see what it says! I guess you and your daughter are both right! But we may never know which one Sendak preferred. Hope your son’s party is a real wild rumpus! Here’s a reason “begin” is better than “start”. Think of what he said at the end of the rumpus. “Let the wild rumpus finish!” or “Let the wild rumpus end!” I like the first. But commence is best of all (Jenny in London)… Let the wild rumpus conclude! I prefer the two-syllable options, myself. But of course the mystery is, why the difference between editions in the first place? The world may never know. Thanks for stopping by, Jeremy! But I am not sure Maurice would approve. What a fabulous idea! Let’s “commence” using it. Thanks for reading/commenting. I must agree w/ cekster, above. “Begin” sounds so much better. And, it has seven syllables, so one might think of it as the final line of a haiku. As a child (and I was born in 1959, and I’m sure my mother, book addict that she was, bought an early edition of “Wild”) I always remembered the line as using “begin”. Paul, Your childhood version must have been the “begin” edition, then. I saw a copy at a used-book store last month, and of course I had to check. It said “start”, but didn’t think to check which printing it was. Thanks for stopping by! Interesting! Perhaps that was Sendak’s intent, then. That is a “collision of consonants!” So well stated, Mark. A lot of people see this post but don’t comment, so thanks for sharing your findings!